Described by ViewSonic product manager Mike Holstein as a phone for the “value seeker,” the ViewPhone 3’s perhaps single defining feature is its price tag: $250 – off-contract. It should start shipping sometime in March, with the target market being Latin America (though, again, it will also be made available in the United States). As for American carrier availability, it likely won’t offered with a two-year contract by any carrier (ViewSonic has, unsurprisingly, had difficulty finding a partner); instead, it will be sold as an unlocked device compatible with AT&T and T-Mobile’s networks. 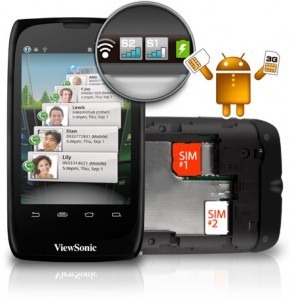 On an arguably more inspiring note, ViewSonic reportedly has plans in place for higher-end successors to the ViewPhone 3, and according to Forbes, these successors might be unveiled as early as the middle of 2012. Additionally, ViewSonic is said to be unveiling several more models of its ViewPad tablet at CES – we’ll keep you posted.